I just assumed, 1.25m reactor comes with 1.25m nozzle. More power (i.e. a 2.5m reactor) needs also a bigger nozzle. How do you know you are doing the right thing? Are there any hints ingame or a wiki or elsewhere on what nozzle to use? Do nozzles have a "rated power" ? i think now it's only for electric engines... however at low power it's better with smaller engines. L.E. after testing seems that bigger engine give more thrust at same power... i thought that the smaller evacuation the bigger pressure, but no. looks like anything with an active generator is having its total EC set to less than one which gets displayed as zero. using 1.18.4 now nothing in the logs shows up and no errors since its doing exactly what it was told to do hehe. dont have to use that anything with an active generator should show the problem. also any chance of updating the change log? looks like its behind just a tad 12/14/17. oh yeah if I remove warp plugin the problem goes away. I was testing things yesterday and I realized something that we need in this. Your modpack uses a unique electric resource called mega joules. Other electric propulsion systems use electric charge, but simply a lot of it. For example Near future propulsion uses power requirements in the thousands of ec/s. However even with antimatter 400gw reactors, because most of the power is actually mega joules and not ec, we can’t use nfp thrusters with interstellar reactors, even if the reactor would irl put out enough electricity to melt the biggest vasmir or mpd thruster. So here’s the solution I thought of. On your generator module why not add a mode switch button. The generators have three modes: mega joules, mega joules and ec, or metric s**t ton of ec. Obviously the less charged particles or thermal power would produce fewer ec/s, but if you could change to ec mode you could use futuristic power supplies in sizes and quantities that make sense. Edit. Also where did the dusty reactor and the gas core reactor go? Those looked cool af. Wouldn't simply increasing the power buffer for EC fix it? I believe it currently has a buffer of 1/1000 of its full capacity. THat should be enough to run 100 Near Future engines at the same time. I doubt your machine can handle that. Even better a simple MM script that replaced the Near Future Engine EC resource consumption by MJ resource. I thought I had already done that but I admit I haven't verified for several years now. Are they not visible in the Filter Extension Reactor submenu? While we are talking about radius of nozzles and reactors, i reported that behavior 1.5years ago, did you find anything? Wouldn't simply increasing the power buffer for EC fix it? Even better a simple MM script that replaced the Near Future Engine EC resource consumption by MJ resource. I thought I had already done that but I admit I haven't verified for several years now. Is powerbuffer something I could do on my end? Unfortunately I only know enough scripting to break things. I thought they might have been removed or something, then aren’t in the power tab and then don’t show up in the tech tree. I do know what I’m doing when installing mods, but it’s possible I have a borked copy. I can always try redownloading the mod. try installing huge batteries for a start, just to try if it gets better. see how many mj's its producing convert to ec and then change the config to make it make that many ec as well. put a solar array next to the sun and watch it die from lack of ec. makes 12 ec but 40 billion mj. ec is ore mj is karbonite. just the way ksp works. so yeah put a bunch of batteries and part count on it or just change the configs and call it a day. the whole ec mj thing has been a problem for years. looks like this resource thing they are trying to implement may finally solve it though but looks like its converting the ec to mj. so instead of 1100 ec the max amount of EC is getting set to the mj equivalent which is like .01100. but it also shouldnt be touching ships with no warp plugin parts on it either. Any idea what the ec to mj math is? It wouldn’t be that hard to simply change the NF engines to accept mjs if it’s a simply as changing config files, assuming I know the ratio of ec to mj. lots of these on Ike, maybe everywhere with no atmosphere. I'll look into it also. That was pretty obvious (really just a single line in there). I'm looking into WHY it's not initialized. I can't reproduce the issue. @Blackline Could you tell me which Intake are you using? 2 supersonic intakes (the spikey ones) followed by 2 precoolers, all 1.25m. // if _moduleResourceIntake is null there SHOULD be an exception - and it's a good thing. It will be fixed in next release. I have changed buffers for Solar Panels, NFE Generator and Stock Generator into unified implementation of what was not that long time ago. But we are working with @FreeThinker on removing variable EC/MJ/ThermalPower/ChargedPower/WasteHeat buffers altogether. I have found the issue. Pre-Cooler was the problem, and because of exception in OnStart. Regression was introduced when MM scripts were created for AtmosphericIntakes. ModuleResourceIntake module is specifically removed for Pre-Cooler. I'll add some null guards for now, but most likely it should be fixed with some MM script magic. To be clear, the solid fuel fission reactor is a cheap first generation fission reaction without the capability to be used for thermal propulsion like the more advanced molten salt reactor. It Can only provide Electric power. 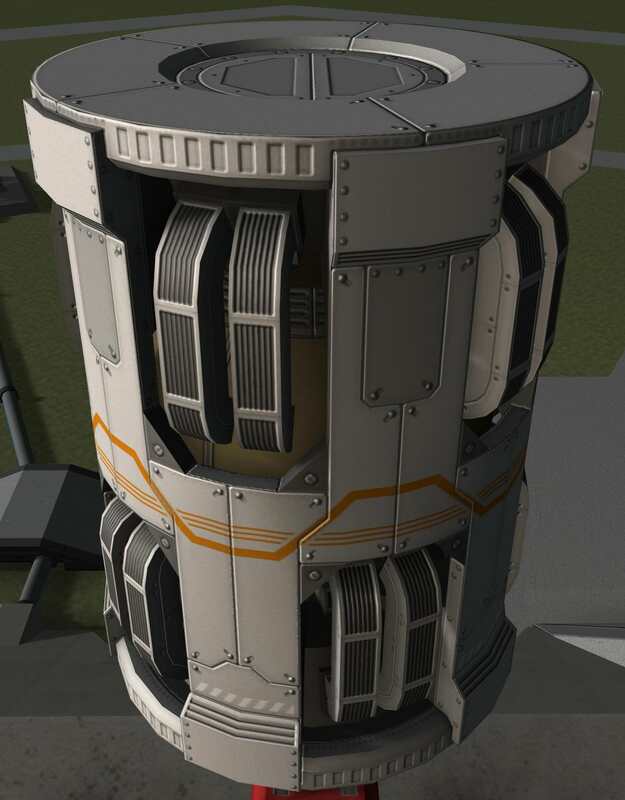 In this sense it quite similar to reactors parts for KSP. @Arivald Ha'gel @FreeThinker Btw, i cloned your GIT and it built all the way through on the first time. GZ for such a tidy project! Thank you for power boost - I'll be starting to work on centralized resource management (consumption/production) which will allow us to remove variable buffers completely. You are welcome. I had that problem as well with my mod, and I am using @Nertea's dynamic battery storage mod. It's somehow close to what KSPI-E is doing I think. What's your plan for such a resource broker? No one did such a thing yet. Would you overwrite the stock requestResource method and catch all requests? Is that possible? Will you change effect all resources?